Why not have something different that sets you apart from your friends and families previous family photo-shoot. Our Face-pull shoots are designed to create a set of images ready to hang on your wall. No matter how many there are in your family, we can shoot and design to your requirements. These shoots work well while all wearing a same accessory and/or same colour clothing but if you have something better in mind, we are happy to go ahead. 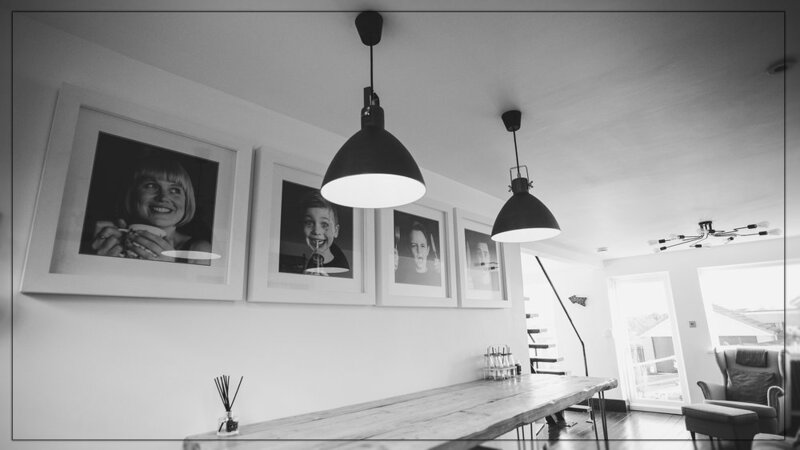 It's always great if you'd like to personalise your images for a particular room like the kitchen shots above. - 16" high quality print. - Bespoke black or white 2.5" wide frame. - Double edge mount with black underneath and white on top or vica verca. - CD with the highly edited images to use/facebook as you wish. - Photoshoot in our Elsecar Heritage Centre studio or at your home. ..........everything is included with no hidden costs. Remember this is the final price you will pay and includes everything you will need to have a set of stunning frames on you wall. Contact us through the contact section to book a shoot or to ask any questions you may have.